Roses will suffer from black spot from time to time, as well as from thrips, aphids, mealy bugs, and other rose-eating bests like the chafer beetle and the red spider mite. Control these insects by either using predatory insects, such as lady bugs, or you can use natural pesticides and insecticides. White oil is also very good in getting rid of rose scale. 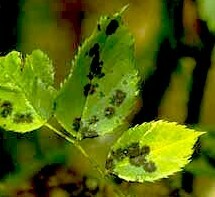 Black spot is one of the 4 major fungal diseases attacking roses. It is easily recognizable by yellowing leaves with large black spots on them. Sometimes even new leaves emerge that are affected. Because black spot causes the roses to lose its leaves, the plant soon becomes weak if it goes unchecked. The ultimate result is that your rose plant will die. The situation is made worse when humid weather is around and you have a wet summer. In order to get rid of the black spot you need to reduce the humidity factor of your growing roses, and you do this by making sure that when you plant them out initially they are not over crowded and try not to underplant too closely with annuals and other small plants. Make sure that your roses have full sun and do not water them in the late afternoon so that the leaves remain wet for a long time. Also avoid watering your roses overhead during the summer heat. When the leaves are wet these damp conditions help spread the fungal spores. If you see any black spot on your roses remove them and burn them. Do not put these into your compost heap. Roses are heavy feeders so give them regular doses of fertilizer every 6 weeks throughout the growing season. This keeps them healthy and therefore makes them resistant to black spot, as well as other rose diseases. Not only that, but roses that are well fed and given compost dressings often will out grow black spot. Also mulch your growing roses well. A mulch of lucerne hay and cow manure is an excellent mulch. Do this every spring, or late winter. Mulching your roses will prevent the black-spot spores from splashing up on to your plants. Spraying the leaves with a foliar feed is also beneficial. Liquid seaweed fertilizer increases rose health and again helps them resist disease. Finally add some wood ash to your soil in winter and dig in lightly around your rose plants as black spot often occurs when there is a shortage of potash in the soil. In the end, none of the above will prevent black spot for occuring, but it will help to reduce its severity. If you need to spray your foliage for black spot use an organic spray. We use a strong chamomile-nettle tea spray every week during the hot summer months and sometimes beyond. This is using 1 part stinging nettles to 1 part chamomile flowers. Let it steep in a bucket of boiling water for 10 days. When you want to use it add 1 teaspoon baking soda for every 2 liters of spray. Or you can use baking soda spray on its own, using 1 dessertspoon of baking soda to 1 liter of water. Another excellent solution to use is cider vinegar in water . Now, some of you may want to question this, as black spot usually grows where a near neutral pH situation occurs. This is why any alterations to the pH will work. I can tell you that this also works like a dream. I use it when I don't have my chamomile-nettle tea. Mix 3 tablespoons of cider vinegar (I always buy Braggs as it has the mother culture) to 5 quarts ( 5 liters) of water. Add 1 teaspoon of vegetable oil and a good squirt of soft soap to make sure that your organic spray sticks to the leaves. Spray on plant early morning or evening to prevent leaf burn. Reapply as necessary, and always after it has rained, once the leaves are dry. If you notice that your roses have yellow, mottled leaves even though you feed them regularly and they have been treated for black spot in the past, your roses are showing symptoms of rose mosaic disease. This is a virus that enters the rose bush when it was grafted. It isn't a serious condition, and your roses should bloom normally, so you don't have to treat it at all. However, you should avoid contamination of other roses. So when you use your sacateurs on this rose bush make sure that you disinfect them before using it on others. If you find that the rose bush has been horribly disfigured and marked by the mosaic disease it will then best to dig it up and replace it. 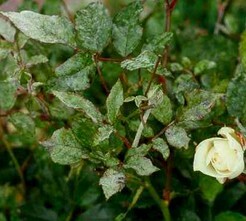 You will notice rose mildew, a very common rose disease, by powdery mould on the young rose leaves and later on the stems. Usually, if your roses are going to get mildew it will happen twice a season. Firstly, when it is the initial growing season where the mildew is fairly mild when it does strike. Then later in the full swing of summer when the second attack is very strong. Here not just the leaves are affected, as in the first round of mildew, but this time the stems are affected as well. The second attack will take place in the hottest months of summer. If left untreated, the mildew will continue through to the fall where white cottony tufts occur on your rose bushes which carry the winter spores. A natural remedy for rose mildew again is using the stinging nettle-chamomile spray as per the above instructions. Ordinary baking soda is also a good natural fungicide for treating mildew on roses as well as other plants. However, an equally good homemade remedy for mildew is ordinary milk. Dilute 1 part milk in 7 parts water and spray on your roses. Apply again if it rains, but wait for the leaves to dry first. Apply again, when necessary. Some roses are more prone to rose mildew than others. Tea roses, China roses and Wichuraianas roses are relatively free from this disease. Thankfully, this is not a common rose disease, as when it hits your roses, they will virtually curl up their toes and die overnight. It is also known as Black Mildew. New shoots become limp and die back, new leaves drop from the stems at the least touch. Fungal patches of brown-yellow appear on the front of the leaves, and sometimes there is even a white mould on the back of the leaves. Spray your roses with a Bordeaux mixture as soon as you see this fungus appearing. You will probably lose young stock, but if caught early you may be lucky to save older rose plants from the disease. Now rust is a common rose disease, appearing towards the end of summer, beginning of fall. Deep orange rust like patches first appear on the stems, and then move onto the leaves. In the fall the winter spores are produced. Now instead of the orange-rust patches, black spots are scattered on the underside of the leaves. These fungal spores will lie dormant during the winter, and if they find the right conditions, they will infect the stems of the roses to produce those tell-tale bright orange-rust patches during the summer. To try and prevent this disease from spreading, remove any of the rust infected leaves and burn them. Do not add them to your compost heaps. When spring comes spray your roses with a Bordeaux mixture to prevent the rust from appearing later on. Again, baking soda in water will do the trick as well. If you find that during those summer months your rose stems are affected with rust, cut those out too, and burn them. 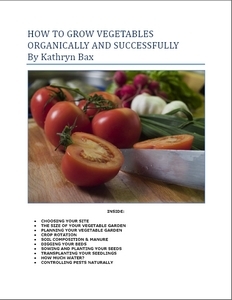 If you find that you cannot cut out certain stems, as it would spoil the look of the plant, then rub them down with some cotton wool dipped in methylated spirits. This type of rose disease can be found on older roses, especially 2 - 3 year old wood, normally at the base of the plant where the wood has swollen and cankered patches. It may be so bad that the affected area may even split right open and you can see traces of the fungus orginating from there. Often these affected areas are from where prior pruning has taken place. The fungus spores having entered the areas where damage has been done to the stems. This is why it is so important that one prunes roses properly, and treats the cut ends correctly afterwards. Using methylated spirits is one way of protecting your roses from any fungal spores that might be lurking. You can Add your own Comments, Tips and Ideas on Rose Diseases Here! We have lots of pages where you can contribute to throughout this website. We love hearing from our readers, and hope you will be one of those we hear from too. Look around our homesteading website. If you have some comments, tips and ideas about growing roses of your own, please submit them. All you need to do is type and submit. We will do the rest!